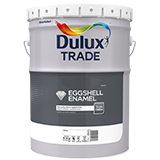 Dulux Trade Eggshell Enamel is a high quality interior eggshell finish. Highly recommended for plaster, metal and woodwork. Appropriate primers and undercoats must always be used, particularly on new work. Ideal for kitchens, bathrooms and children’s playrooms.